with Spink and Sons, London, where purchased by the present owners in January 1994. See introduction to lots 56-61. The Phoenix collection was assembled over a period of thirty years by Mr Joseph Hackmey, whose family founded the Israel Phoenix Assurance Company. Mr Hackmey is a world renowned collector with a keen eye for 20th century art. He was committed to assembling the finest collection of Israeli art outside public collections, as well as a highly important international collection of Impressionist, Modern and Post-War art. Following a change in the company's ownership, Christie's have sold masterpieces of 20th century art from the collection on several occasions. Among the highlights sold was Jasper Johns' 1961 masterpiece O through 9, sold at Christie's New York in 2002. In 2003, Christie's London sold a magnificent painting by Picasso depicting his lover Marie Thérèse Walter, Femme dans un fauteuil. Other highlights sold by Christie's over the last few years include paintings by Chaim Soutine, Mark Rothko, Agnes Martin, Barnett Newman as well as Picasso's Buste de femme, a portrait of Dora Maar and a 1945 still life, Poireaux, crâne et pichet. David Bomberg and Gustav Bauernfeind were European artists who visited Palestine in the late 19th century and early 20th century and depicted its landscape and exotic inhabitants. Their work is well represented in the Phoenix collection, typically concentrating on Israeli landscape subjects. The fine group of paintings by Bomberg offered in this sale reflects the collector's discerning eye and commitment to collecting in depth several works by the same artist depicting the same subject, namely Jerusalem from different views. The two works on paper represent other aspects of Bomberg's work, his commitment to Modernism in Quarrying - Jewish Pioneer Labour, (lot 59), while the Palestine Restoration Fund (lot 61) relates to the reason for Bomberg's visit to Palestine. David Bomberg was born in Birmingham, the fifth child of Abraham and Rebecca Klein Bomberg, Polish-Jewish immigrants who had come to England to escape the Russian and Polish pogroms. By the time he was five years old, Bomberg's family had moved to London's East End and he initially attended the Castle Street School before a grant from the Jewish Educational Aid Society enabled him to enrol in the Slade School of Fine Art in 1911. At that time, the Slade had a reputation, under the tutelage of Henry Tonks, as leading the way for the British avant-garde and actively reacting against the more traditional taste of the Royal Academy. William Lipke recounts an episode of such a clash between the two institutions: 'Several Slade students decided to go one at a time into the Royal Academy to collect a party of unsuspecting art-lovers and take them on a lecture tour. Bomberg, then a student of the Slade, is said not only to have got in and gathered a small party about him, but to have made a great blast - following his innocent opening speech praising the Academy - against the Royal Academy and all it stood for. He was then promptly thrown out and heated correspondence is said to have been exchanged between the Academy and the Slade' (see David Bomberg, London, 1967, p. 34). Bomberg studied alongside an extraordinary generation of Slade students that included Stanley Spencer, Paul Nash, Christopher Richard Wynne Nevinson, William Roberts and Edward Wadsworth. It was also a particularly key moment in the development of art in Britain as Roger Fry staged his seminal Post-Impressionist exhibition at the Grafton Galleries in November 1910 which included works by Cézanne, Van Gogh and Gauguin. Bomberg would have also been introduced to both Futurism and Cubism through current exhibitions and he travelled to Paris in 1913 with Jacob Epstein, where he met Picasso, Derain, Modigliani and others. Bomberg spent a brief period designing for Roger Fry's Omega workshops, however, more importantly he was, at this time, producing some outstandingly mature works, including Ju-Jitsu, circa 1913 (Tate, London) which ensured his inclusion in the 1913 exhibition, Exhibition by the Camden Town Group and Others. He was a founder member of the London Group and showed In the Hold, 1913-14 (Tate, London) in the exhibition held in March 1914. His work was attracting critical praise and Roger Fry wrote in his review of the exhibition: 'Mr Bomberg is developing a quite distinct type of abstract design ... Of Mr Bomberg it would be rash to prophesy as yet, but this much may be said, that he has the ambition, the energy and the brainpower to strike out a line of his own. He is evidently trying with immense energy and concentration to realize a new kind of plasticity' (quoted in W. Lipke, op. cit., p. 42). The dynamism of Bomberg's paintings of this period brought him into contact with Wyndham Lewis and the Vorticists, however, Bomberg rejected being bracketed with this group: he refused to have his work illustrated in Blast magazine and would only allow his paintings be included in the 'Invited to show' section of the 1915 Vorticist Exhibition held in London. During the war, Bomberg enlisted in the Royal Engineers and served at the Front in 1916. By 1917 the strain of the war, including the death of his brother, must have become unbearable for Bomberg as he shot himself in the foot. Once the injury had healed he was able to turn his hand to painting and he was commissioned by the Canadian War Records Office to produce a canvas to record an aspect of Canada's contribution to the war. Bomberg was given a strict brief and was asked whether 'you are prepared to paint this picture at your own risk to be submitted for the approval of the Committee. The reason for this request is that the Art Adviser informs us that he is not acquainted with your realistic work, and cubist work would be inadmissible for the purpose' (see R. Cork, exhibition catalogue, David Bomberg, London, Tate Gallery, 1988, pp. 21-2). The painting that Bomberg initially produced 'Sappers at Work': A Canadian Tunnelling Company (First Version) was instantly rejected and Konody labelled it a 'futurist abortion'. Bomberg had to re-work the compostion and submitted a much more realistic and less ambitious painting. Bomberg struck out on a different direction with his work after the war and moved towards a more organic feel, leaving behind the mechanistic near-abstraction that marked much of his pre-war work. He turned to landscape painting and also, in the early 1920s, painted a number of his 'Imaginative Compositions'. He continued to draw inspiration from the community around him in works such as Ghetto Theatre, 1920 (Ben Uri Art Society, London), however, he was becoming increasingly isolated from former friends and colleagues and frustrated with his work, a pattern of behaviour from which he would suffer throughout his career. He was invited out to Switzerland to join Ben and Winifred Nicholson, but as Bomberg's first wife, Alice Meyers, recalls, the trip was not a success, 'The trip to Ben Nicholson's Villa in Lugano ... was a complete fiasco; no work was done by David. It was bitterly cold, the snow was lying heavy ... and we were unprepared with warm clothing. Ben and Winnie were used to working out of doors, so there was no studio accomodation, and David was used to the comfort of a studio ... from the start he was unhappy. David did not hesitate to speak of his discomfort and after talking it all over and sending all the grievances to ... Winnie's mother, it was agreed that she should advance us our homeward fares and call it a day. We were only there a fortnight' (see W. Lipke, op. cit., pp. 51-2). Bomberg was clearly ready for a new direction in his work and it was his friend and fellow artist, Sir Muirhead Bone, who suggested, in 1922, that the newly-formed Zionist Organisation might be able to employ Bomberg as an official artist in Palestine. With the financial support of the Palestine Foundation Fund (Keren Hayesod) and Bone himself, who had reassured the Zionists that, 'Bomberg is done with that & means in Palestine to do sober, serious, really 'record' work!' (see R. Cork, exhibition catatogue, op. cit., p. 24), Bomberg set off with Alice to Palestine in April 1923. The Bombergs were greeted in Jerusalem by Clifford Holliday, the chief architect and town planner of Jerusalem, who introduced them to the city. Both Alice and David were overwhelmed by the panoramic views over the city of Jerusalem. Richard Cork writes, 'Instead of finding a Tuscan hill town, as it was defined in so many religious paintings of the Quattrocento, Bomberg realized that the Jerusalem he was gazing at was a Russian toy city, punctuated by red roofs, jewelled with the gildings of the Mosque spire - set against hills - patterned with walls encircling the Christian holy places - the horizontal lines accentuated by the prependicular forms (of) the minarets. As his eyes travelled over this unexpected scene, Bomberg must have experienced the first stirrings of his prolonged obsession with Jerusalem's distinctive structure. He would soon become so absorbed in scrutinizing its perculiar interplay of 'flat roofs, vaults, domes, street arches, abutments and buttresses' that they were placed at the very centre of his art for the next five years' (see Exhibition catalogue, David Bomberg in Palestine 1923-1927, Jerusalem, The Israel Museum, 1983, p. 8). The Bombergs settled in accomodation in the hills with views of the Old City and the Mount of Olives as far as Bethany and the road to Jericho. Bomberg recalled years later, 'I was a poor boy from the East End and I'd never seen the sunlight before' (see R. Cork, exhibition catalogue, op. cit., Tate Gallery, p. 24). His work took a new direction as he began to paint landscapes in the open air. Importantly he moved away from depicting the human figure in his paintings and instead focused on painting panoramic landscapes of the surrounding city. Richard Cork comments, 'The blazing intensity of Jerusalem was as far removed from the machine age as Bomberg could possibly have desired, and it reinforced his determination to concentrate in future on regaining his lost rapport with the natural world. Palestine's primordial grandeur prompted him to scrutinise the landscape with an avidity he had never shown before' (ibid.). During his time in Palestine Bomberg acquired some important patronage and through Sir Edward Marsh, he met Sir Ronald Storrs, Military Governor of Jerusalem, who bought works from Bomberg and encouraged others to do likewise. 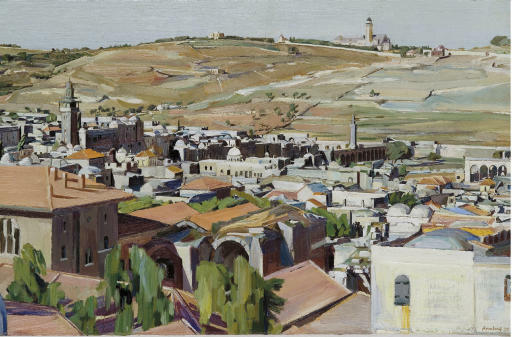 Storrs was also instrumental in persuading Bomberg to undertake the journey to Petra in 1924 and to focus on his meticulous descriptions of the architecture of the city of Jerusalem: 'Storrs was passionate about the restoration and preservation of Jerusalem, and he described Bomberg's paintings as 'the best presentments that I have ever seen of those immortal prospects: the light white summer dust parched and blinded: the stones cried out: They were Jerusalem' (see Exhibition catalogue, David Bomberg: Spirit in the Mass, Kendal, Abbot Hall Art Gallery, 2006, p. 82). In 1925 the Bombergs moved into new lodgings which were above the Banco di Roma, opposite the citadel entrance, and Bomberg painted a number of works from the rooftop, looking out towards the Holy Sepulchre and the Pool of Hezekiah (see fig. 2). The extraordinary body of work that Bomberg produced during his Palestine stay was painted at a crucial time in his development as an artist. Although the work was supported by some patrons during his time in Palestine, it was not so warmly received by collectors when he returned to London. The critics were complimentary regarding the 1927 show at the Leicester Galleries, but this was not reflected in sales and only seven out of the fifty five paintings sold and due to expenses related to the exhibition, Bomberg was left £80 in debt. Bomberg was, however, woefully neglected as an artist throughout his lifetime and at the time of his death in 1957, he was virtually forgotten. The Tate had acquired only two minor works during his lifetime and many of his paintings remained stored in a warehouse, unsold and unseen. His reputation has now been completely reassessed and he stands as one of the greatest masters of 20th Century British painting, also leading the way for the generation that followed him, including Frank Auerbach and Leon Kossoff, his pupils at Borough Polytechnic.